This post links up with #WASO on The Adoption Social where the theme is 'Recipes and why the are important to us'. I love cooking. I always have done since I was little. Whilst friends were reading Secret Seven, I'd be poring through cookery books, making up menus for when I was older and had dinner parties. The Readers Digest Cookery Year was my bible. Those cookery books are part of me and I've recently found a few on ebay. I've still got my recipe book from when I did Cookery O'level. Reading all the old books brings back great memories. I find cooking very relaxing, whether it's doing it or watching it. I'm in the moment, concentrating on something I love to do, I find it quite mindful. I'd love to go on Bake Off! Meanwhile, I reckon Daddy should apply for Masterchef. He's great at savoury, particularly Indian or South-East Asian, whilst I major in cakes! Although, I have to say his Vanilla Baked Cheesecake is to die for. So, it's no surprise that cooking features quite a lot in our household. Missy loves joining in. In fact, during introductions, when Missy spent a day at ours, we made Apple Muffins that went down a treat. She joins in with Daddy when he's making bread or cheesecake and loves helping me to bake. I let her do as much as she can, helping occasionally where the mixture needs a better mixing or putting things in the oven. Now her reading has improved significantly, she can start to read the recipe too. If she's in a negative mood then cooking will cheer up. I also see cooking as a positive way to help her with her food anxiety and she now has a better sense of what is healthy and what's not so healthy. I asked her on the way to school what are her favourite things to cook. She said Brownies and Pizza!. We do homemade pizzas using pitta bread for the base, a mix of tomato puree and red pesto to spread over and then a choice of chopped red onion, peppers, tomatoes, bacon, goats cheese and cheddar to sprinkle over the top. Five or so minutes in the oven and they're ready to eat. I introduced this activity quite early on as it's a good family activity to do together. The Brownies are a Polly Noble recipe that are dairy free and use raw cacao powder which you can find in health food shops or buy online. Warning, they are VERY chocolatey! Every now and then I like to cook by myself so will make something whilst Missy is at school, although I do usually leave the decoration for when Missy comes home. Yesterday I made Parsnip & Pumpkin Seed Cake as I had a glut of parsnips to use up. I've used beetroot and carrots before so figured parsnips would have a similar result. The recipe actually uses walnuts but I didn't have any so used pumpkin seeds instead and I think they make a lovely addition. Of course, without Missy around, it means I get to indulge in licking the bowl (and I have to admit to leaving a little extra mixture in the bowl!). 2. Grease and line an 8"/20cm cake tin. 4. Add in oil, sugar, grated parsnips, vanilla extract and lemon zest and stir well together. 5. Sieve together flour, cinnamon and salt and stir into the parsnip mixture along with the pumpkin seeds. The mixture should be a soft dropping consistency but if its too thick, add 50-75ml of milk. 6. Pour into prepared tin and cook for 60-75 minutes until well risen, golden and a knife inserted into the cake comes out clean. Leave to cool slightly in tin before turning out onto a wire rack. 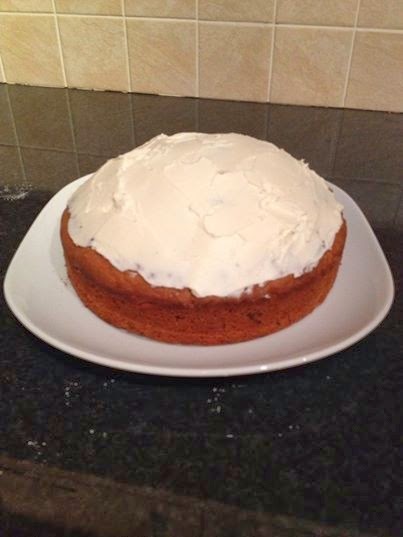 For the topping, I used 200g of mascarpone cheese mixed with a tablespoon of icing sugar but you could also use cream cheese mixed with some lemon zest, or icing sugar mixed with water or milk to a smooth consistency, or just dust it with icing sugar. I think it might also be nice made in two sandwich tins and then sandwiched together using the mascarpone or perhaps lemon curd. I could waffle on for ages about cooking, in fact maybe I should have written a cooking blog! Cooking will definitely feature during the forthcoming Easter Holidays, perhaps some Easter Biscuits or a Simnel Cake. I've also read about some local cookery classes for young children which I'm quite sure Missy would love to do. Right, I'm off to buy the ingredients for tonight's pizzas. A few days ago, as we got into the car to go to school, Missy decided that the plait I did in her hair (the same type of plait I do every day) was not good enough. She started crying, shouting, screaming at me. For five minutes I had a torrent of abuse hailed at me from the back seat by a 6 year old. "I've had a fed up morning with my Mummy!!" "You've done my plait wrong, you do everything wrong!!" "Don't talk to me, I don't walk to be spoken to!!" "I hate this family, I don't want to see the judge!!" "You're a horrible mummy and I hate my hair!!" I didn't say anything because I would have just got shouted down and she would have screamed even more loudly. By the time we parked up, I was shaking but I tried to remain as calm as possible and not let her see I was shaking. Missy got out the car, threw down her bags at my feet and shouted "Carry my bags!!" and ran off in front of me. I walked fast after her. "Don't follow meeeee!!" she screamed several times. Nevertheless she waited for me so we could cross the road but didn't want her hand held and dug her nails in hard. If another parent had said anything to me at this point, even 'Hello', I might have burst into tears. Then as soon as we got to the playground, Missy saw her friends and instantly changed her mood into the delightful, happy, fun-loving girl that we know she can be. She even gave me a kiss goodbye. There's been a lot of shouting lately. Yesterday I was 'a horrible and ridiculous mummy' because her trainers were still damp after being cleaned the day before (caked in mud from an enjoyable walk) and it meant she couldn't wear them to swimming. On Sunday, she and Daddy went out for a little run which she normally loves to do. But not on this occasion. Half way round she started screaming and shouting, sat on ground, kicked and bit Daddy and shouted at him to "Shut it!!". I can handle these outbursts much better now. I remain fairly calm and, when I know it's appropriate, I will talk to her, 'wonder' what is wrong, talk about feelings, etc. Sometimes its best just to leave her calm down in her own space and time and we're getting to know when this is the right thing to do. she's seen a picture of a friend's Celebration Hearing with the judge. She still doesn't believe it though and her anxiety levels are through the roof. It must be exhausting for her little body with all the stress hormones working overtime. At times she is delightful, loving, engaging and then the switch flips and anger, frustration, fear takes over. We try to watch for triggers but something that she's usually been fine could that day be the straw that broke the camels back. At other times she'll surprise us by taking stuff in her stride. Take yesterday, the school called me at 8.15am to tell me the after school club was being moved to a Wednesday. Talk about short notice and as I was up in London I had to arrange for another parent to pick her up. Missy handled it really well, accepted what was happening and loved going to her friends for tea. I was very proud of her. It's exhausting for us too, not knowing what mood from one minute to the next. At least Missy is happy about one thing and that's that we are going ice skating two days after the Celebration Hearing. I got a massive hug for that one. In among all the anxiety Missy is currently exhibiting (which I'll blog about separately), we had some calmer and enjoyable moments this weekend, thanks to a package we received last week. The lovely people at Weekend Box Club sent me one of their boxes last weekend and although it was addressed to me, I let Missy open it. Her face was a picture of delight. The Weekend Boxes contain four activities to do over the weekend, including things to bake, make, explore and something green. Almost everything you need for the activities is included in the colourful box, save for things like, say, scissors, pen or a few of the ingredients for the cook activity (although they did include some spice mixes for our food). Each activity has its own sheet of instructions too and part of the box can be cut out to make a certificate once all the activities are completed. As Missy loves to cook, we did this activity first for our Saturday lunchtime. On the menu was Green Pancakes which actually were spinach fritter-type things and I have to say went down really well. After lunch Missy made a rainbow pot with the colourful pipe cleaners included in the box and we played the suggested Pot O'Gold game with the gold treasure coins also included. There was a lovely little tale on this sheet about Leprechauns (ideal with it being St Patricks Day today) and finding them at the end of rainbows. Then Missy made a lovely bird for the Make activity which I think is really sweet. Finally, yesterday, we did the Explore activity which was all about sound, including thinking about vibration and the sounds animals make. I also added a game outside which was to close her eyes and hear how many different sounds she could hear. At the end of each activity there is a sticker to be had and Missy is a sucker for a sticker. As you'll know if you're a regular reader of my blog, Missy is big on making things and this Weekend Box was perfect for her. It also provided an enjoyable time for us together - next time I'll get Daddy to do some of the activities with her (though I suspect, as is the case at the moment, she'll want me to oblige). 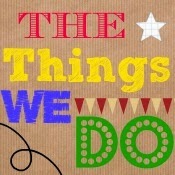 If you'd like to try out a box for free, go to www.weekendboxclub.com and use my unique code SARAH153. Enjoy. Disclaimer: I wasn't paid to write this blog although I did receive the Box for free from the lovely people at Weekend Box Club in exchange for this review. 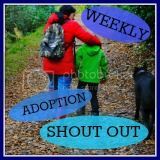 I've just been looking back over my old blog posts so I could link up with From The Archive on The Adoption Social. It's clear how much we didn't know about attachment and trauma from reading some of those posts. What I've learnt over the last 18 months comes in part from Theraplay and also in part from books I've read, most notably 'Creating Loving Attachment' by Dan Hughes and 'From Fear to Love' by Bryan Post. But I think I learnt the most from other adopters; from reading their blog posts, meeting up and chatting with other adopters, from reaching out on Twitter. In fact it was an adopter who first lent me those two books. Not a lot was learnt from social services. I slightly cringe at some of the things I wrote in my earlier blogs. From what I know now, I know I was naive in my earlier thinkings about how Missy was behaving and how we should act. I'm by no means an expert now but my understanding has grown a lot. It's still a near-vertical learning 'curve' though. Missy's anxiety levels have ramped up. We've had the good news that the Final Hearing has taken place, that there were no objections from Birth Mum and that the Celebration Hearing would take place soon. Missy's SW came round to talk to her about it with us and she seemed to take it in and understand the significance of it. Her first reactions were of excitement and happy to be here forever with us. She was delighted that we'd have to get her a new dress for the Celebration Day and even more excited that we would be going out for lunch afterwards. Since then we've had the date for the Celebration Hearing and explained again to Missy what it means but she is getting very anxious about meeting the Judge. 'No' is the most used word in her vocabulary and she's regressed at times to a toddler. The slightest thing will trigger her anger and anxiety, often it's food related. The calm we had at the beginning of the year has temporarily disappeared. It feels a bit like this time last year although we have a better idea of how to help her therapeutically this year. More good news for us but another layer of anxiety for Missy is that Daddy has gone back to work. Hurrah!! He's got offered a job where the hours are perfect, unlike his last job. This job is Monday to Friday, 8.30am to 5pm. We get to have proper weekends together as a family now. However, because he starts earlier it means he and Missy no longer have breakfast together and he no longer takes Missy to school. This hasn't gone down well with Missy and several times last week, just before the two of us were due to leave for school, her frustration and upset boiled over with wails of "I want Daddy, I want Daddy, I want Daddy". She's angry with him, which is a shame because after a period of being anti-Daddy last year she had calmed down and Daddy was her friend again. We need to tighten those boundaries again, revisit what we did at Theraplay last year, do some more Ladybird relaxation and get our tin hats out to protect us from the physical and verbal ammunition coming our way from Missy. I so want to hold my hand out to her, like you would a timid animal, but it often gets bitten off. Daddy and I have to be strong for her at the moment but at times there is only so much abuse one can take, even from a 6 year old. And if anyone else says "Oh but she'll be fine once the Celebration Hearing happens and she'll forget", I might just deck them, or at least invite them round here for the afternoon (actually no, Missy would be on compliant best behaviour). Right, best get Missy from school and get the pancakes on. That's one thing we will all be happy about tonight. Yum!